Ah, anticuchos. The thought of them brings me back to childhood, and the slightly acidic aroma of the marinade sizzling over charcoal conjures up memories of family picnics in the park in Canada where, despite all the talk of multiculturalism, we were reminded of how foreign we were. Nothing quite says “not from around these parts” like barbecued organ meats, eh? Aaaanyway, here’s my anticuchos recipe, which comes mostly from my mother’s version, with a few adaptations from the cookbook, ¿Qué cocinaré hoy? In a nutshell, anticuchos is a grilled meat dish, made by marinating cubes of beef heart in a strongly acidic marinade and then grilling them on skewers. 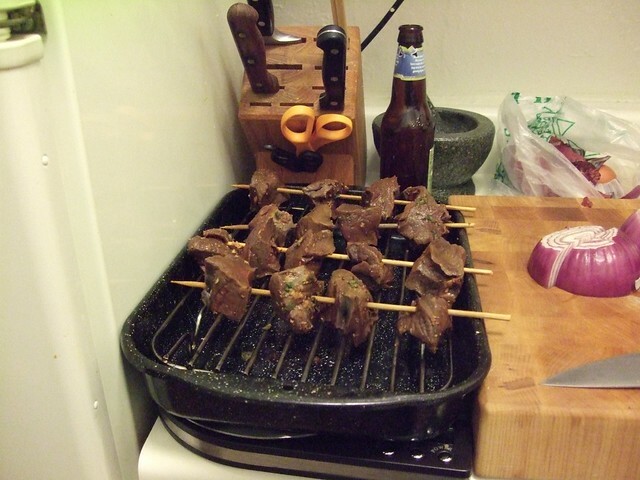 Anticuchos are grilled meat skewers, most commonly beef heart (anticuchos de corazón). 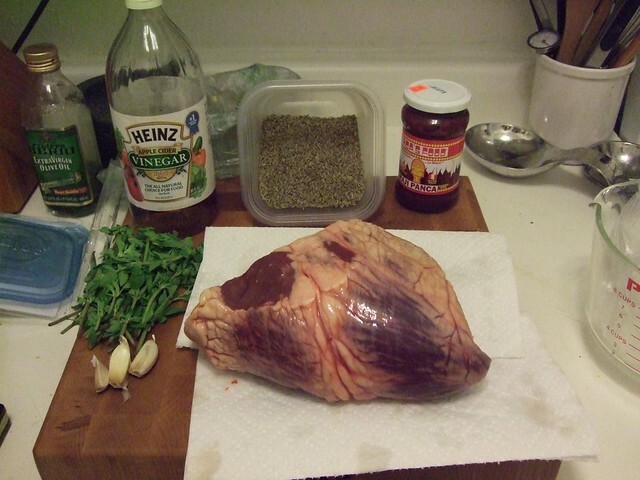 The heart is cleaned and cut into relatively large cubes and then marinated overnight in a marinade of acidic liquid and aromatics. The cubes are then skewered and grilled to desired doneness. Anticuchos require meat, some rather acidic liquid, and a blend of aromatics. The traditional Peruvian meat for anticuchos is beefheart. The acidic liquid of choice is cider vinegar, with the optional addition of dark beer for a malty, caramel, slightly bitter taste. For aromatic ingredients, I’m using garlic, cumin, a mixture of dried and fresh oregano, and a LOT of ají panca (which is a ground paste of a pepper that grows in Peru that has the smoky taste of a hot pepper without actually being hot); you can use exclusively dry or fresh oregano depending on what you have available in your kitchen. My mother also likes to add achiote (annatto), which lends an orange-yellow color and a very faint aroma of nutmeg (which I find overwhelmed by the other ingredients, which is why I don’t both putting it in). 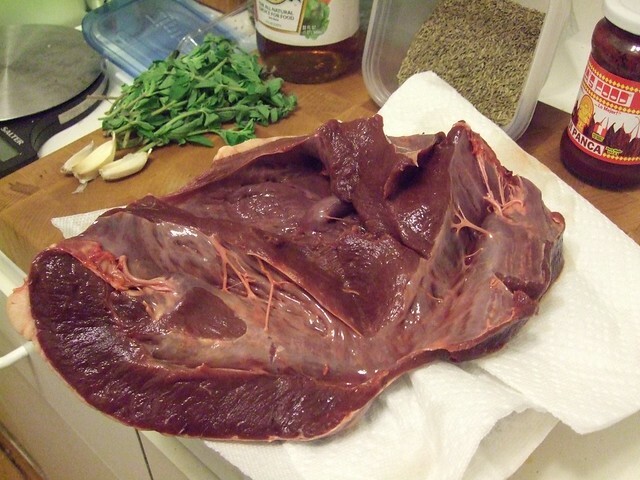 You may need to order the beef heart ahead of time from your local butcher. If you order ahead, you may be able to ask your butcher to trim off the fat and artery valves for you, which saves some time. The heart of a full-grown cow or steer is really the best for flavor and consistency. 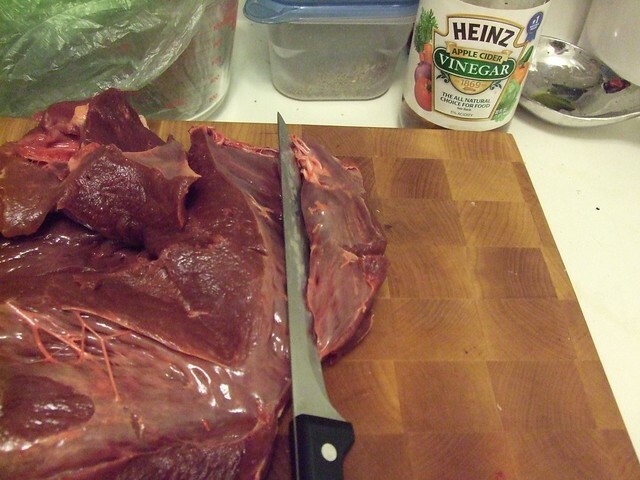 If you can’t find it, though, many Mexican/Latino stores sell calf/veal heart; you may need to buy two of them to match the size of a full-grown beef heart. The meat is most commonly beef heart (at least in Peru), but can be substituted with other cuts of beef, chicken, or even seafood; if you use more fatty or tender cuts of meat, you will only need to marinate the meat for a few hours, instead of all night. I imagine that this would work well with various types of game and venison. You can substitute other sorts of vinegar, but I would avoid fruity or sugary vinegars (like raspberry or balsamic), which might mess with the balance of aromatic ingredients or burn over the fire. The marinade needs to be rather acidic to properly tenderize the meat, so avoid low-acidity vinegars (or, fortify them with some white vinegar). I could imagine using citrus juice instead of vinegar here, but you would need to use mostly limes to get sufficient acidity. You can find ají panca at your local latino food shop (or, if you’re lucky, your Peruvian import store), usually as a paste. If you also don’t have access to dried Mexican peppers, you can substitute a heavy dose of paprika (mild, otherwise you’ll be inhaling aerosolized capsaicin as you cook). If you’re using a non-red meat (chicken, pork, seafood, etc), you may want to choose milder aromatics. 1. Wash the heart out thoroughly pouring cold water into the cavities and pumping it back out to remove any blood from the interior. 2. Clean and cut the heart into 3cm x 3cm cubes (approx. 1″ cubes). This is a bit hard to describe, so I’ve included several photos below. Essentially, trim off the hardened fat and arterial valves near the top. 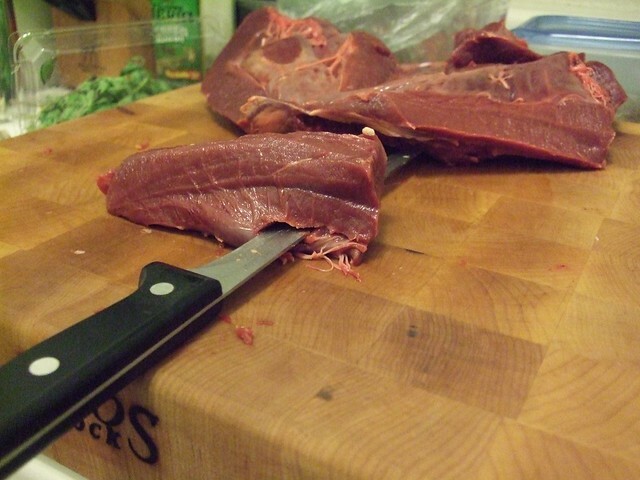 Then, you cut the heart lengthwise and start cutting it into thick strips. 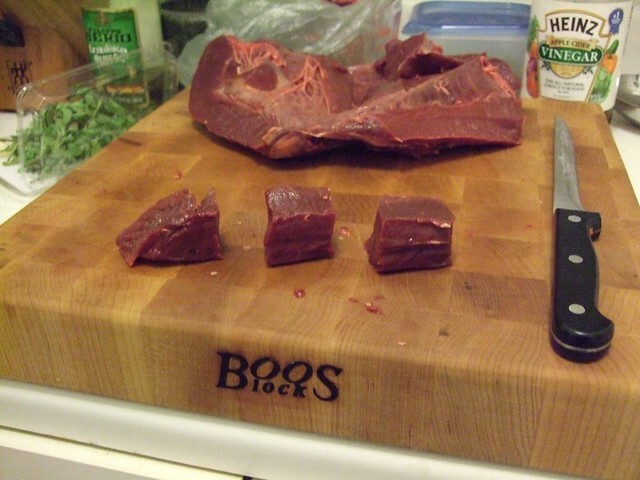 Then, you take each strip, press it against the cutting board with your palm, and then slide your (very sharp) knife parallel to the cutting board to remove the thin layer of fat and veins on the outside as well as the heart-strings and papillary muscles on the inside. Then, cut into cubes. 3. 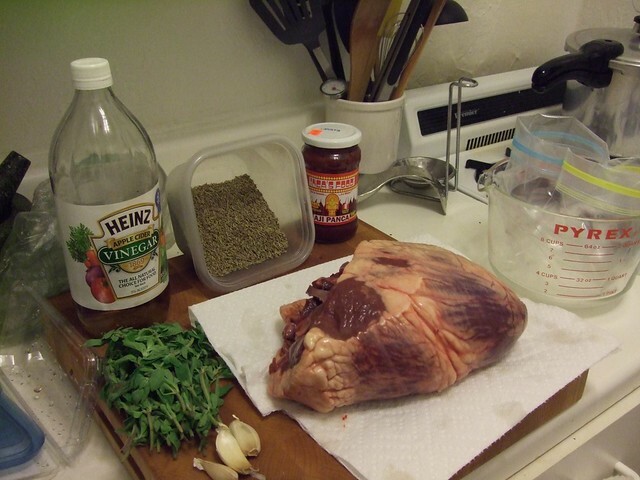 Put the heart into a non-reactive container (i.e., plastic, glass) and add the garlic, oregano, and cumin. 4. Add the ají panca. Don’t be stingy with it! This is where a lot of the flavor comes from. 5. Add the beer and the vinegar and mix well. 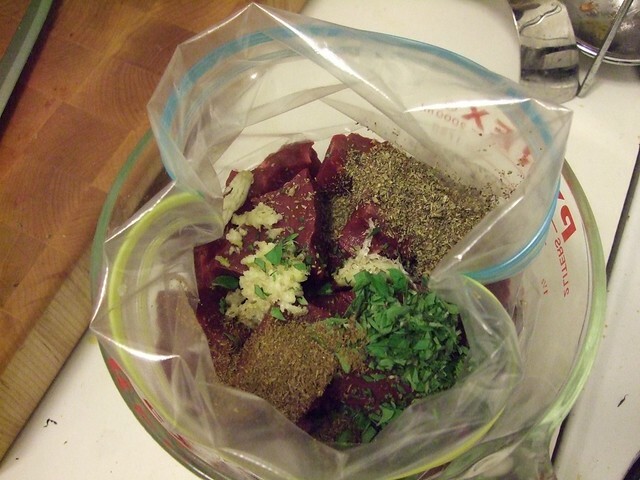 You may need to add more vinegar to ensure that there is enough fluid for every part of the meat to be covered. 6. 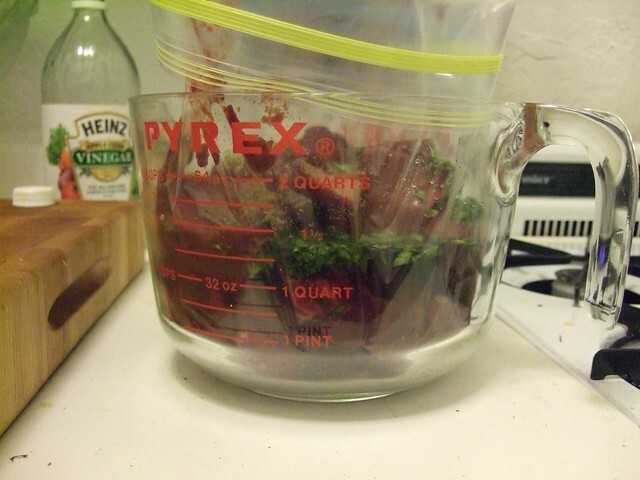 Press the meat down into the liquid and close your container. If you’re using a zip-top bag like I am, you’ll want to squeeze out as much air as possible from the bag. 7. 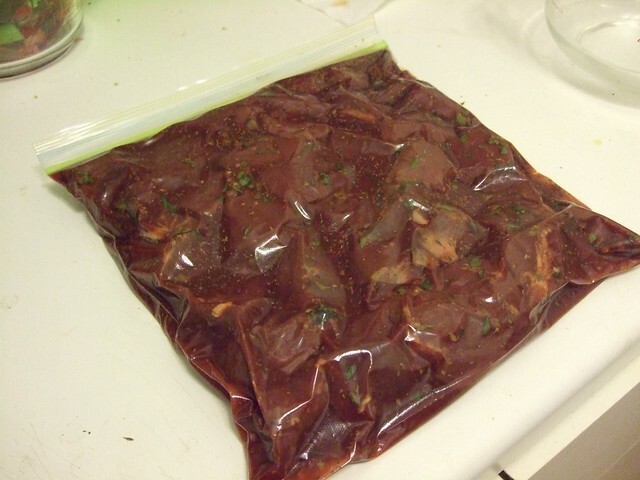 Leave to marinate in your refrigerator overnight. 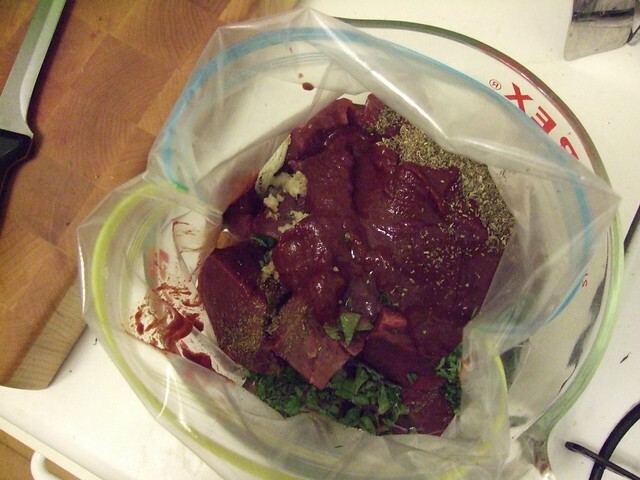 You can even let this marinate for a few days, if you want a stronger flavor and more tender meat. 8. A few hours before cooking, soak your skewers in water (if they are made of wood/bamboo; metal skewers need no soaking). 9. Turn on your barbecue (or your broiler, which is what I’m using here) and start skewering the cubes of meat, leaving at least a finger’s-breadth of space between the pieces of meat. 10. Lay the skewers to cook, with a bit of space between each of them. If you have a heat-safe brush and an open grill, you can make up a basting sauce of ají panca, salt, and olive oil, which you can apply to the meat as it cooks. 11. Cook until browned and slightly charred on the outside, but still tender to the touch. If the pieces of meat decrease substantially in size, you should pull them off the heat. Until you’re used to gauging this, you can pull a piece off one of the skewers and cut it in half; the center should be a little bit pink. 12. Serve and eat immediately. Looks great….but I think this is the sort of project I’d prefer to leave until after trying it cooked by someone more experienced in the use of hearts. Much like your ceviche, which I will at some point be attempting at home. Certainly understandable, considering the how rarely folks cook with organ meats these days. If there’s a Peruvian restaurant in your area, they’re more than likely to prepare this dish, since it’s considered a very traditional appetizer / snack. I actually set this up myself on my own time, using a WordPress template and a few of my own images. Alas, I haven’t had the time to update it for quite some time, which I suppose is the problem with doing things all by yourself. Best of luck with your blog!